Contact Fort Lauderdale Slip & Fall Lawyers Gerson & Schwartz, P.A. Over one million Americans are injured in slip and fall accidents each year. According to the Occupational Safety and Health Administration (OSHA), 15% of accidental deaths are caused by slips or falls. The causes of slips and falls may be everyday occurrences. It can be the business owner that doesn’t clean up the spill on the floor, the homeowner who hasn’t repaired their broken steps, or the employer with an uneven walkway in the parking lot, any of which cause injury to unsuspecting individuals. As a result, you and your family may be subject to lost wages and mounting medical bills through no fault of your own. Fort Lauderdale is in Broward County. Within its city limits, there are approximately 180,000 residents. But for many years, the tourist traffic in Fort Lauderdale was the economic lifeblood of the community. Years ago, Spring Break was the tourism highlight of the year. Typically, it would take place in the six weeks before Easter. But over time, the city cracked down on the college crowd and the Spring Breakers began to go to other locations such as Panama City and Daytona Beach. Fort Lauderdale re-invented itself into a higher end family destination vacation location. At the same time, the economic development of downtown Fort Lauderdale grew dramatically. 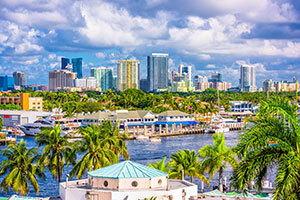 Now, Fort Lauderdale is a popular city for young professionals who prefer to live and work in the same area. In support of this population, numerous restaurants, bars and trendy stores have opened and thrived. As population and commercial establishments increased, the instances of patrons and guests to be injured in slip and fall accidents also climbed. That is why victims of negligence injured in slip and fall accidents in Fort Lauderdale often look for the best Fort Lauderdale slip and fall lawyer they can find after an accident. The Fort Lauderdale slip and fall legal team at Gerson & Schwartz can help you navigate the process. For over 40 years, our Fort Lauderdale slip and fall attorneys have helped injured clients restore the lives they once led. Injured parties often ask if they have a claim, are they entitled to compensation, or how they can receive medical treatment for their injury. 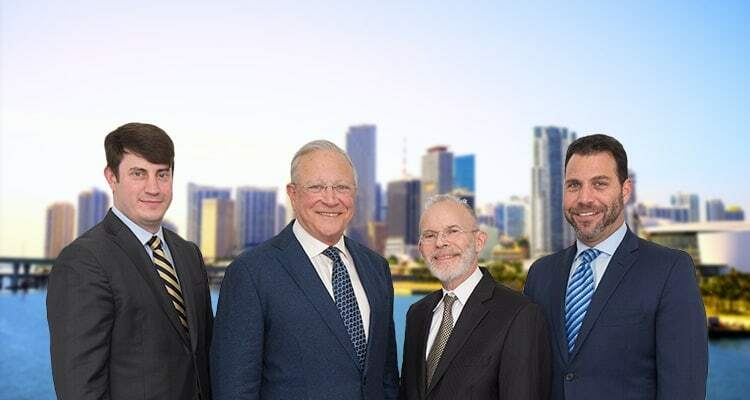 If you’ve been injured and would like to speak to our Fort Lauderdale slip and fall attorneys, contact Gerson & Schwartz at (305) 371-6000 for a free consultation. Not sure you have a case? Would a free conversation with a Fort Lauderdale slip and fall accident attorney help? Contact Gerson & Schwartz for a free consultation. Injuries from slip and falls accidents can occur in businesses, homes, or at your place of employment. In some cases, injuries resulting from slip and fall accidents can result in debilitating pain, permanent disability, or death. Head injuries – Often occurring in a slip and fall accident, the victim may hit their head on a hard surface as they lose their balance. Head injuries and traumatic brain injuries can result in serious and permanent damage. Back and spine injuries – These injuries often occur when the victim tries to regain their balance or catch themselves from falling. Sudden movements by the victim to prevent injury can cause broken bones, pulled muscles, and slipped disks. Injuries to your back and spine can cause mobility issues, as well as extensive pain and possibly surgery. Neck injuries – similar to back and spine, neck injuries often occur as the victim tries to prevent injury while falling. Sudden movements forward, backward, or from side to side, can cause the neck to tense up, potentially causing injury and pain. Broken bones – Slip and fall accidents may often result in a broken pelvis or hip. The elderly population is especially prone to broken bones as the result of a slip and fall. Treatment of a broken pelvis or hip often results in surgery and long recovery times. Torn ligaments – Losing your balance and trying to catch yourself can often result in torn ligaments in the knees and wrists. These are painful injuries that may require physical therapy or even surgery. Given the nature of the injury, torn ligaments may not always return to their original state, potentially leaving the victim with a permanent and painful injury. If you have been injured, give our Fort Lauderdale Slip and Fall Lawyers a call today at (305) 371-6000. We will listen to you and answer your questions.